Soil microbial biomass is a key source of soil organic carbon (SOC), and the increasing proportion of microbially derived SOC is thought to drive the enrichment of 13C during SOC decomposition. Yet, little is known about how the δ13C of soil microbial biomass differs across space or time, or with the composition of the microbial community. Variation in soil microbial δ13C may occur due to variation in substrates used by soil microorganisms, and variation in how different microorganisms synthesize biomass. Understanding these variations in soil microbial δ13C would enable more accurate interpretation of patterns in the δ13C of SOC. Here, we report the variation in δ13C values of individual phospholipid fatty acids (PLFA) within podzolic soils from mesic boreal forests characterized by steep decreases in fungal to bacterial (F:B) ratios. 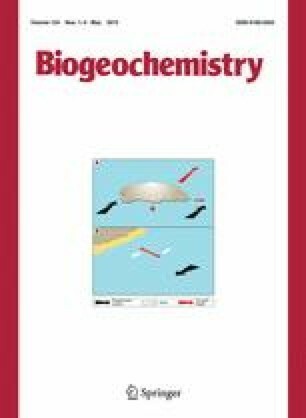 By comparing trends in δ13C of PLFA indicative of either fungi or bacteria to those PLFA common across both microbial groups, we tested the hypothesis that the enrichment of 13C in bacterial relative to fungal biomass represents a mechanism for the increase of bulk SOC δ13C with depth. We demonstrate that PLFA derived from fungi were consistently depleted in 13C (−40.1 to −30.6 ‰) relative to those derived from bacteria (−31.1 to −24.6 ‰), but unlike bulk SOC the δ13C of PLFA from either group did not vary significantly with depth. In contrast, the δ13C of PLFA produced by both fungi and bacteria, which represent the δ13C of soil microbial biomass as a whole, strongly increased with depth (increase of 7.6–8.4 ‰) and was negatively correlated with the fungi/(fungi + bacteria) ratio (R2 > 0.88). The steep increase of the δ13C of general PLFA with depth cannot be explained by an increase in the δ13C of either fungal or bacterial biomass alone since the PLFA indicative of those groups did not vary with depth. Instead, these data demonstrate that the increase in soil biomass δ13C with depth is driven by a change in the proportion of bacterial relative to fungal biomass. We suggest that the increased proportions of soil bacterial relative to fungal biomass with depth may represent an important mechanism contributing to increasing δ13CSOC with depth via contributions from ‘necromass’ to SOC. The online version of this article (doi: 10.1007/s10533-015-0107-2) contains supplementary material, which is available to authorized users. We thank Jamie Warren for laboratory assistance; Thalia Soucy-Giguère for help with field sampling; Birgit Wild, Lucia Fuchslueger, Frances Podrebarac, and Scarlett Vallaire for helpful conversation and comments on the manuscript; and Frances Podrebarac for providing the soil profile pictures used in Fig. 1. We furthermore thank three anonymous reviewers who helped to substantially improve the manuscript. Our study was funded by the Natural Sciences and Engineering Research Council of Canada, the Center for Forestry Science and Innovation (Department of Natural Resources, Government of Newfoundland and Labrador), the Canada Research Chairs program, and the Humber River Basin Project (Government of Newfoundland and Labrador).